A new release of Incendia Next is now available for Download. This version of Incendia NEXT includes several new features such as new symmetry functions, new baseshapes, new example files and several new enhancements to the 3d mesh generation module. For a list of changes, please check the Release Notes. The new release of Incendia Next is now available for download. This Incendia Next update is mainly for introducing the new resolution system. The new resolution system removes the old set of fixed resolutions and also increase Incendia render resolution up to 17k on the donors version (on a system with 8GB of ram). This version is a major update for Incendia NEXT. This version is a bug fix version for solving compatibilites with some Windows 10 users. 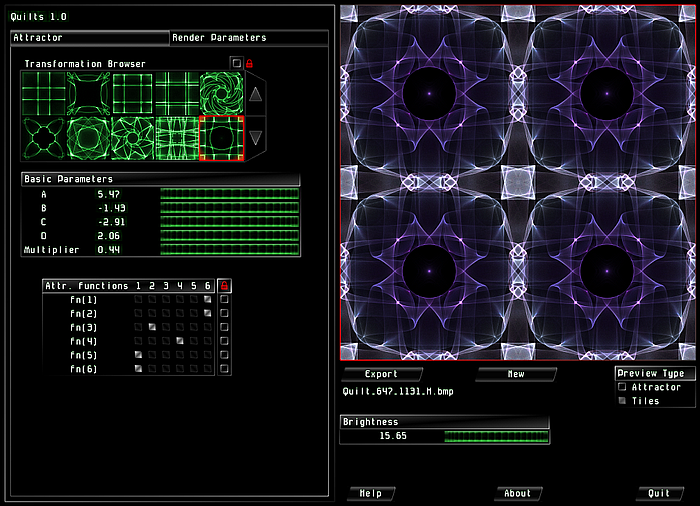 In this release, The Quilts Generator is included. 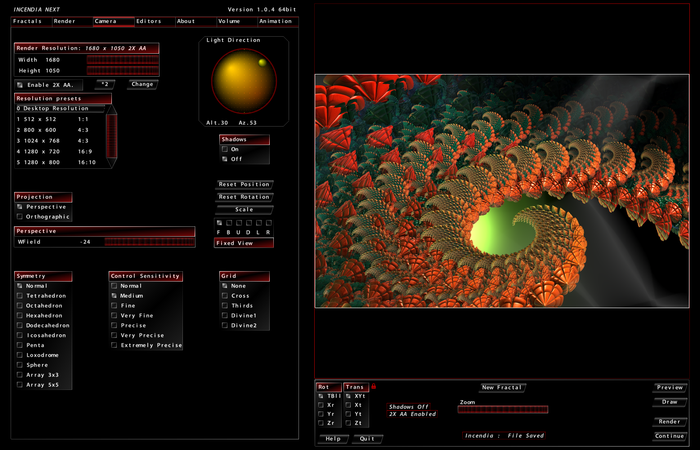 Incendia Next Resources are also available (located at AuralFractals.net). 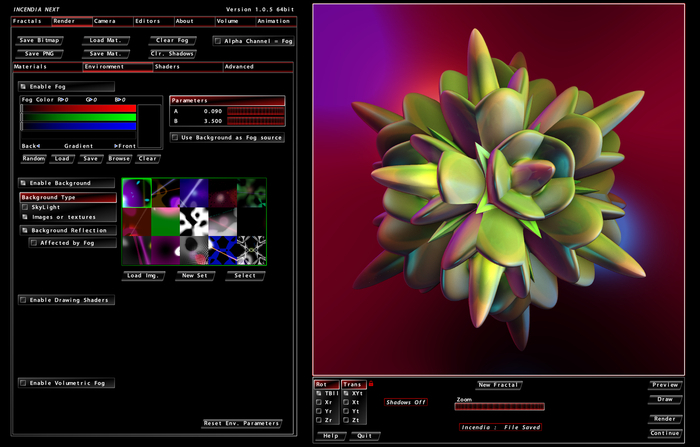 The as in the previous Incendia release, The Donors version includes The Sphere Generator, a mesh generator that uses several interpolation methods for creating spherical meshes and The Snowflake Generator. The second release of Incendia Next is now available for download. This version is a bug fix version and also has some enhancements. 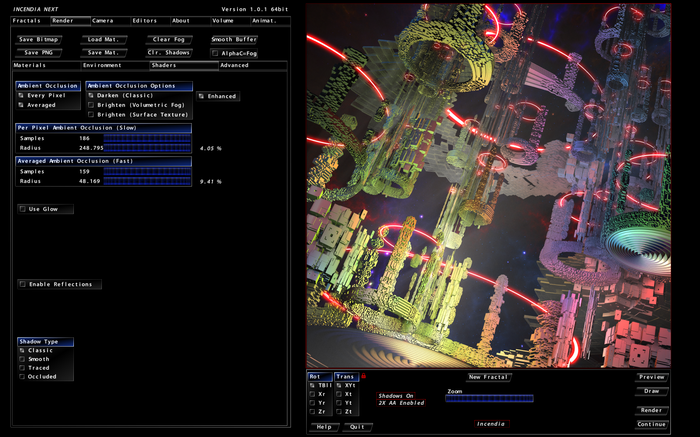 Incendia nows works on all GPU systems. Previous Incendia didn't works on integrated gpus due to an unsupported OpenGL extension. Also, most screen resolutions are now supported, in the first releases low screen resolutions causes the program to crash. This version doesn't replace any previous Incendia versions, being an standalone program. Geometrica and the Quilts are still in developing state. On next release the will become available. The donors version now includes The Sphere Generator, a mesh generator that uses several interpolation methods for creating spherical meshes and The Snowflake Generator. The first release of Incendia Next is now available for download. Geometrica and the Quilts are now developing state. Soon the new version of Incendia (Next) will be avalable to download. Unlike the previous Incendia versions, Incendia Next will be available as a developer version, because I need to fine tune several aspects of the new engine, and before continue it is better to check that all of the implemented features works well on the most systems. I still need to add new new baseshapes as well as new fractal generators, but first let check if all the new engines works well. There are many in depth changes on Incendia, and for example, Volumetrica is no more required, since it is implemented on Incendia (Volumetrica is now an option in the baseshape editor). I'm closing now many of the last minutes changes before the release and soon will make it. 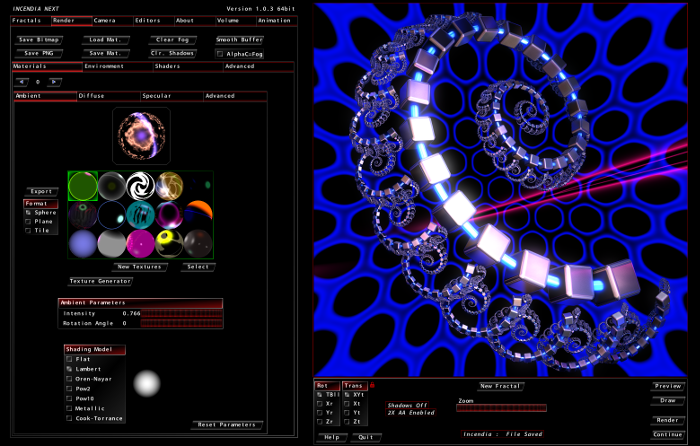 The fourth release of Incendia EX VI is now available. This is a new release of Incendia EX VI, that includes several new features, such as new baseshapes and modifiers, new shader options and several interface enhancements. 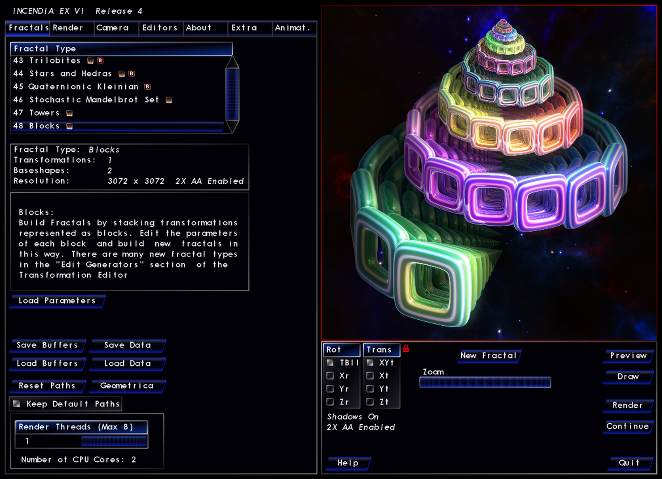 It also fixes several bugs from the previous Incendia release. Also, Volumetrica includes a new features for 3D printing. This software needs time & money, but i have lot of... time. If anyone wants to help me a little, I will greatly appreciate it. 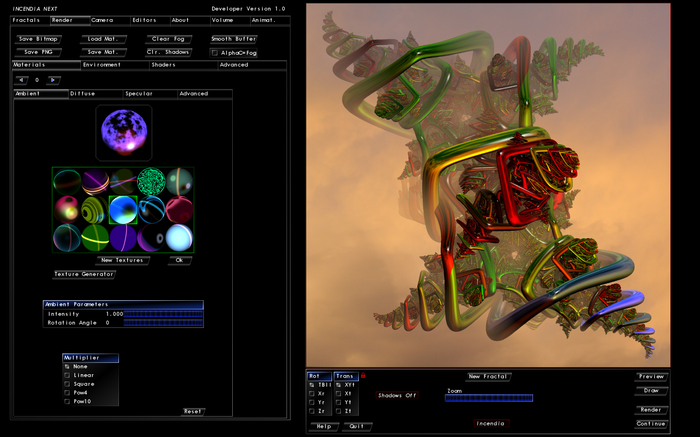 Incendia is a 3D fractal program that uses Iterated Function Systems (IFS) for 3D fractal generation. 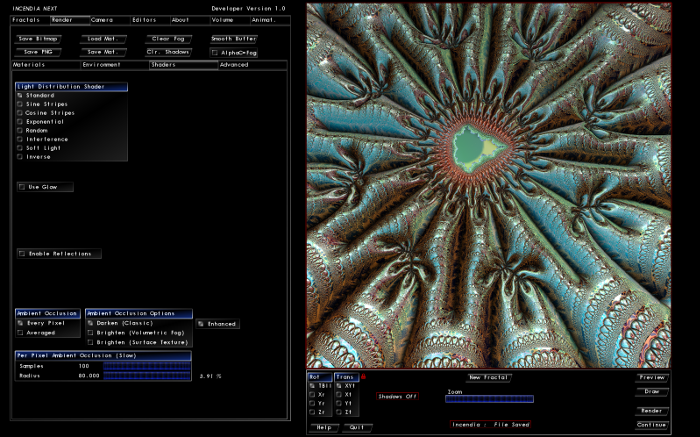 It also uses several parametric surfaces in order to build complex fractal structures.